One of the earliest obtainable maps of Bombay or Mumbai, India. Plan De Bombay et de Ses Environs. This beautifully hand colored c. 1750 Jacques Nicolas Bellin map of Bombay (Mumbai), India. Bellin's map illustrates Bombay as it was becoming the British East India Company's primary base of operations in India, replacing Surat to the north in light of hostilities. 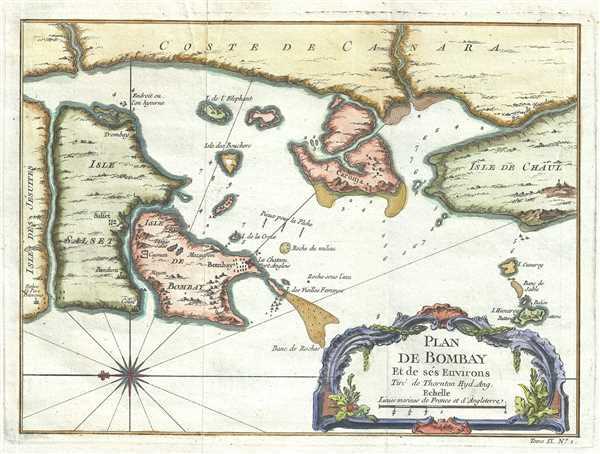 Bombay was under lease to the East India Company from the British Crown, who had acquired the island from Portugal as part of the marriage agreement between Charles II and Princess Catherine of Braganza. With easy access to the Persian Gulf - Indian Ocean trade route, Bombay quickly became a busy harbor town and important center for British commerce. Despite being a center of trade, early maps of Bombay are surprisingly scarce. For this map Bellin had to use the late 17th century map of Samuel Thornton. Thornton's map is the earliest known printed map of Bombay and is today, for all intent and purposes, unobtainable. All subsequent maps of Bombay until the late 18th century were based exclusively on the Thornton map. Bellin's small map, here, is not exception and Thornton's work can be seen in its general layout as well as in the soundings, anchorages, and annotations. Drawn by Jacques Nicolas Bellin and published as plate no. 1 in volume 9 of the 1752 French edition of Abbe Provost's L'Histoire Generale des Voyages. Provost, A., L'Histoire Generale des Voyages, Vol. IX, plate 1.